Curved screens … on flat panels. First up some nice words about the curved displays. I’ve visited a few clients homes where the back wall was actually curved and this made the installation of a large curved panel fit well into the room. In my own home, my family room system places the TV into a corner just above the equipment stand. I recently replaced a 55” flat panel with a 55” OLED that is slightly curved. Given that LG is the only player right now in the OLED game, it was one LG replacing another. To my pleasant surprise, the curved nature of the panel slight as it might be, is lessened more given the angles of the back wall. When viewing programming, you don’t even notice that the display is curved. 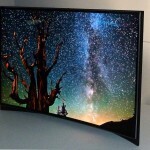 Of course when the display is off, the curved aesthetic helps the display blend into the room even more. Why were the 2.40 screens curved in the cinema? One reason and possibly a main reason had to do with the fact that the image was projected onto this screen. This was not some giant LCD or OLED flat panel that was 40 feet across. It was just some acoustically transparent material stretched out on a giant frame. The key words here and the difference lie in one little fact. The image was projected. Yup, a projector projects the image onto this curved screen. Let’s step back and think about the projector now. How is the tiny image from a film frame …be it digital or real … actually projected in order to make something the size of your thumb into something that might be 40 feet wide? It doesn’t become like that naturally. The projected image has to go through a lens. Another key word, a lens. This leads us to another question about the nature of optics, what shape is the lens on a projector, on a camera, on your cell phone? Is the lens square? is it triangular? No, the lens are circular and spherical. They are not flat. So the source of the projected image is not flat. It may have been flat on the film frame, but the nature of the lens on the projector adds a level of distortion into the projected image. The center of the lens is closer to the screen than the edges of the lens. If an image is projected onto a flat surface, there will be more image distortion in the corners and more focus issues. Project the same image onto a curved screen and the distortion and focus is better. So one of the reasons for using a curved screen was to overcome the distortions introduced by the projector lens into the system. On the home front, and back to the curved flat panels; where is the projector in the case of my 55” curved OLED? No, wait … there is no projector. And there in lies the problem. 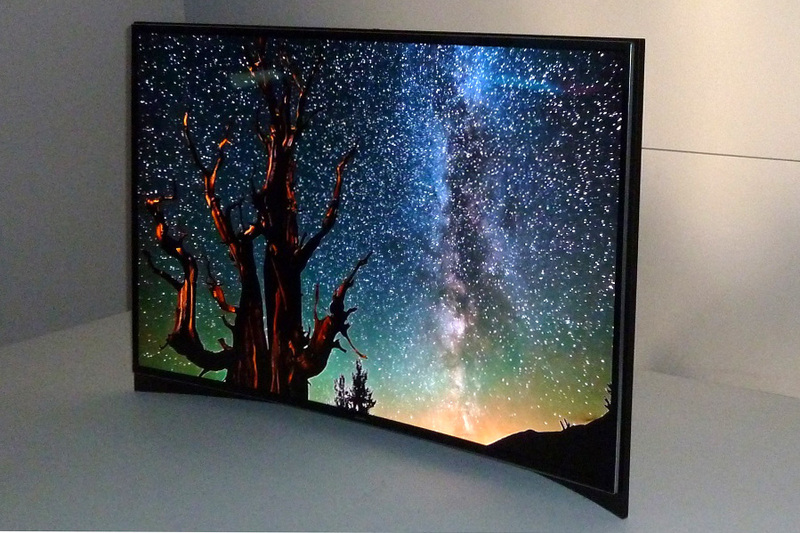 Curved panels are actually here more for marketing than for any real image quality improvement. Too much curve on a TV and it can introduce distortion on the edges. Think of a picture of people on a sheet of paper and what the people on the sides look like as I start to curve the paper toward you. They start to look more and more skinny. A person walking from one edge of the image starts out skinny … widens out as he approaches the center of the image and becomes skinny again as he approaches the other edge of the image. There is a chicken and the egg story somewhere … because images are originally captured by camera through a lens so distortion is there to begin with. But not all images are captured by lenses. Some are created in the digital realm where there is not built in distortion. IPS screens are way better for viewing angles than curved screens. So a flat LG with IPS has much better off angle viewing than a Samsung curved screen that does not use IPS screens.